The cover of 500 Beers suggests the book is “the only beer compendium you’ll ever need.” That Sellers Publishing promotes each of the books in this series—500 Cocktails, 500 Smoothies and Juices, 500 Salads—the same way makes the boast no less embarrassing for author Zak Avery. Avery modestly points to the challenge that confronts five books published within the past year—variously profiling 1,000, even 1,001, maybe 500 beers—each seeking to add something in the way of narrative. 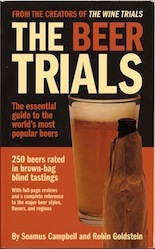 Such guides existed before America’s craft beer renaissance began in earnest (for instance The Great American Beer Book from James Robertson in 1978), but for 30 years until he died in 2007, British beer writer Michael Jackson’s work set the standard. His books always offered a rather complete introduction to beer and beer cuisine, and the template is hard to forget when reading a new set of authors. • 500 Beers is the most compact of the books, making it easy to compare five similar beers at a time. Given that Avery—Britain’s Beer Writer of the Year in 2008—runs one of the most highly regarded bottles shops in England, it shouldn’t be a surprise that 500 Beers reads like stopping in a great store and getting expert advice about a strong selection of beers from both sides of the Atlantic. 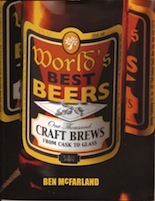 • Of these books, only in World’s Best Beers are multiple beers from a brewery grouped together rather than being presented in various categories or styles. That quite suits a book designed as a trip around the world. Although author Ben McFarland, twice the British Beer Writer of the Year, solicited help in choosing beers to include, World’s Best Beers is delivered in his unique writing voice. He’s a writer for the 21st century. Thus cleverly written sentences—such as “Lost Abbey’s brewmaster Tomme Arthur pushes more envelopes than a postman on crack”—provide genuine insight. 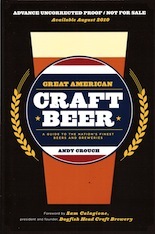 Although none of these authors breaks new ground in ways that Randy Mosher did with Tasting Beer and Pete Brown in Hops and Glory, together they represent a new generation of beer writers—that includes bloggers—who are finding ways to talk to a new generation of drinkers in ways Jackson or Robertson never would have imagined. Understanding that can be liberating. “Setting out in life with the ambition of becoming the next ‘someone else’ is an extremely daft thing to do,” McFarland wrote. The notion a single book could provide “the only beer compendium you’ll ever need” might still appeal to publishers, but moving beyond that impossible goal will make it easier to tell readers something genuinely new. Episode 3: After Two Beers with Rebecca Newman of Summit Brewing Co.